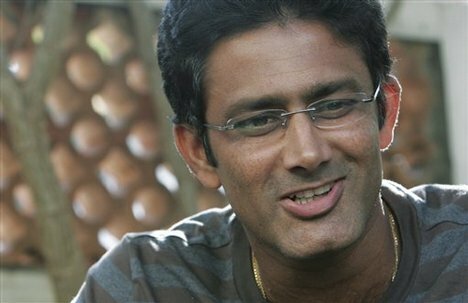 The former India Test captain and last year’s Royal Challengers Bangalore leg spinner Anil kumble quits from Indian premium league (IPL 4) players’ auction scheduled for January 8 & 9 in Mumbai. Kumble takes this decision only just three days before the players’ auction to the Board of Control for Cricket in India (BCCI). Kumble, right-arm spinner has given the reason of other business commitments for withdrawing to IPL. The reasons for retirement of Kumble could be his administrative post in Karnataka Cricket Association where he elected as president in November of last year and his interest in wild life photography. He said, "I wish to withdraw from the players' auction for IPL-4 scheduled for the 8th and 9th of January 2011 in Bangalore." He also added, "I have enjoyed my stint at the IPL so far and thank all concerned for the support extended." He pulled out from IPL even he is one of the 22 players who get base price of $400,000. Kumble had given his first appearance in 1990 and retired in 2008 and after that he used to play with IPL and remained as captain during 2009 and 2010 in Royal Challengers Bangalore team. He played for all three IPL editions owned by Vijay Mallaya in Bangalore Royal challenger team. After a year he put his team at third position and thereafter when he became captain in 2009 edition, he qualified his team to the final T20 league. Kumble has proven himself by taking 45 wickets during third season of IPL.